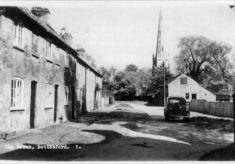 Pictures of various subjects including Bottesford school children, Bottesford Amateur Operatic Society, men outside the Bull, children at the Cross, Devon Lane, St Marys churchyard: also a drawing of the old toll gate and a sketch map of Bottesford dating from 1846. 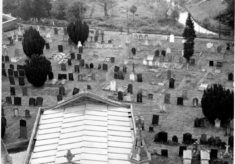 Picture taken from the roof of the nave of St Mary’s looking eastwards over the church yard. 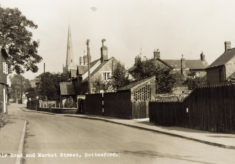 Postcard showing the northern end of Belvoir Rd approaching the Market Place. Postcard of Market Place showing Bugg's butchers shop. 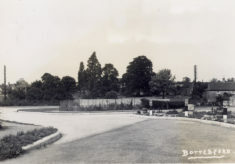 Postcard from Belvoir Road looking north to the Market Place with Harry Bugg’s butchers shop on the left. 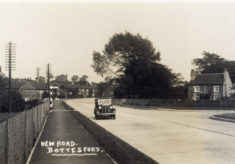 Postcard of the new junction of Easthorpe Lane with the new Grantham Road. 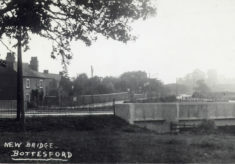 Postcard of new Grantham Road bridge and houses on Easthorpe Lane. Postcard of Queen Street, looking northwards, old Coop on left. Market Street, Samuel's store on the left. 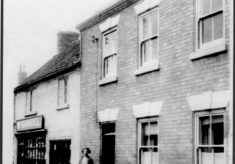 A photograph showing houses on Market Street, with K. Samuel’s store on the left. Postcard of Queen Street, with the old Police Station, malthouse and Rutland Arms on the left. 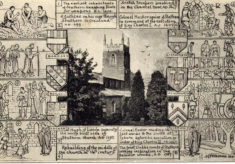 Postcard of Stathern St Guthlac's church and a series of historical cartoons. An old postcard showing Stathern St Guthlac’s church, with a series of historical cartoons around the margins. Map of Bottesford by schoolboy L. Challands of Mr Gordon's academy in 1848. 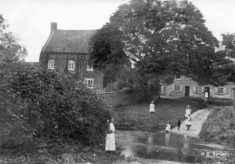 Postcard of the ford on Devon Lane, pre-WW1 as indicated by the style of clothes worn by the children. 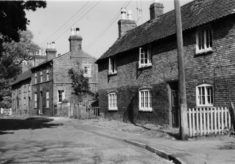 Ford and footbridge on Devon Lane, c.1960. 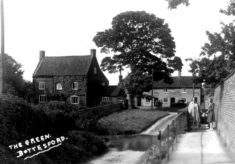 Postcard of the ford on Devon Lane, c.1960. Note that the roadway appears to be un-metalled. A summer's day at The Green, Devon Lane. A summer’s day at The Green, Devon Lane. Chapel Street, children and bunting, 1911 Coronation celebrations. 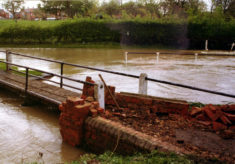 Damaged footbridge at ford on Rectory Lane during flooding. The footbridge at the ford on Rectory Lane damaged during flooding, probably in the 1960s. Rectory Lane ford, heavily flooded, Greaves' bicycle shop on the left. A class of junior school children in the yard behind Bottesford village school, 1950s. 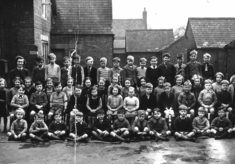 Bottesford school children posed in the school yard. Bottesford boys football team, 1928-29. Bottesford boys football team, 1928-29, posed in a yard (location uncertain). Bottesford Amateur Operatic Society, Trial by Jury cast in costume. Children prepare for May Day celebrations, 1953 Coronation Year. 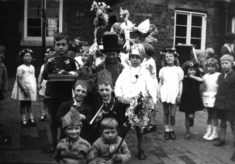 Children prepare for May Day celebrations in the school yard, probably in 1953, Coronation Year. 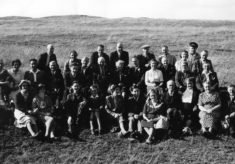 Villagers on an outing to the countryside, together in the sunshine, location uncertain. 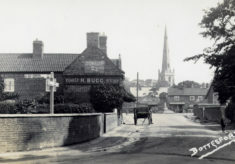 Item: Postcard of Market Place showing Bugg's butchers shop. Item: Postcard of the new junction of Easthorpe Lane with the new Grantham Road. 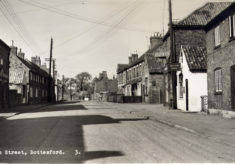 Item: Postcard of new Grantham Road bridge and houses on Easthorpe Lane. Item: Postcard of Queen Street, looking northwards, old Coop on left. Item: Market Street, Samuel's store on the left. 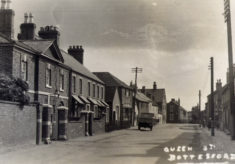 Item: Postcard of Queen Street, with the old Police Station, malthouse and Rutland Arms on the left. Item: Postcard of Stathern St Guthlac's church and a series of historical cartoons. 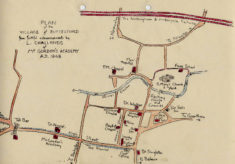 Item: Map of Bottesford by schoolboy L. Challands of Mr Gordon's academy in 1848. Item: Ford and footbridge on Devon Lane, c.1960. Item: A summer's day at The Green, Devon Lane. 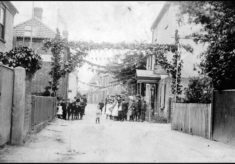 Item: Chapel Street, children and bunting, 1911 Coronation celebrations. Item: Damaged footbridge at ford on Rectory Lane during flooding. 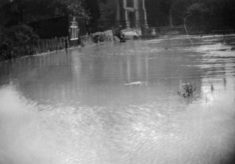 Item: Rectory Lane ford, heavily flooded, Greaves' bicycle shop on the left. 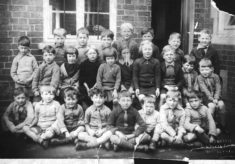 Item: Bottesford school children posed in the school yard. 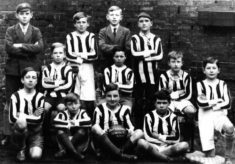 Item: Bottesford boys football team, 1928-29. Item: Bottesford Amateur Operatic Society, Trial by Jury cast in costume. Item: Children prepare for May Day celebrations, 1953 Coronation Year. Item: Bottesford Angling Club at Easthorpe Bridge, 1928. Item: Tommy Robinson and child at the church porch. Item: Guests at the W.I. dinner, 1950. 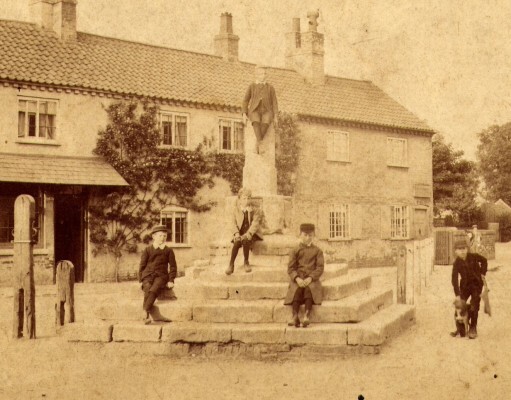 Item: Postcard of the Market Cross and Stocks, with the village school behind. Item: A bridegroom taking a break outside the Bull Inn, Bottesford Market Place. 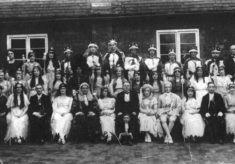 Item: Bottesford Amateur Operatic Society, cast of The Mikado at Bottesford school. Item: The ford on Devon Lane looking towards The Green. Item: Drawing of Bottesford turnpike toll gate.